When Steve Delmore retired, he and his wife, Lydia, decided to devote even more time and resources to give back to the community. “We have always been strong supporters of charities and we believe it’s important to help other people in need,” says Steve. “When I retired, we wanted to do all we could.” For the last four years, they have provided support to Bailey-Boushay House (BBH) through generous matching donations at the Chef’s Dinner, contributions to the annual fund and through Steve serving on the Board of Directors. 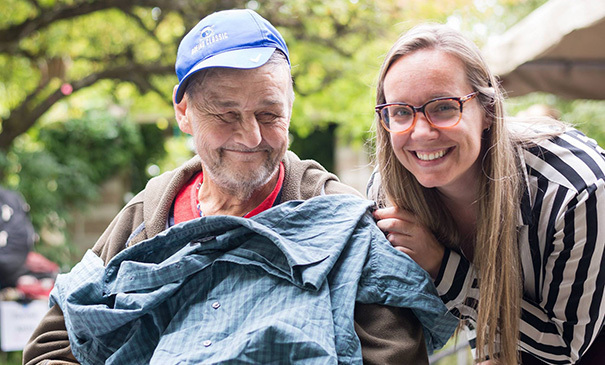 Steve knows the challenges of caring for people in a residential environment. He retired as executive vice president of Merrill Gardens after more than 20 years of service. He was responsible for the day-to-day operations of 56 retirement, assisted living and memory care communities in fourteen states. He knew about BBH as a place that people with HIV/AIDS could be referred but was unaware of all the services provided. Steve and Lydia were impressed when they learned about the wide scope of programs Bailey-Boushay offered. The Delmores have also taken a leadership role in encouraging other donors to give. In 2017 and 2018, at the Chef’s Dinner, a fundraiser for BBH programs, the couple offered to match gifts during the fund-a-need portion of the evening. During the last dinner, Steve gave a speech on why BBH is essential to the community.